Between 1752-1753 a 100-foot (31.4- metre) frigate was built at The Royal Danish Chartered West Indian and Guinean Company's shipyard in Copenhagen. The frigate was christened Cron Prindz Christian after the prince who later became King Christian VII. After the launching followed the work of the fittings, rigging and accoutrements. The first journey in the triangular trade was extra long. At last they ended in the town of St. Louis on the island of Hispaniola, where the surviving slaves were sold. The first attempt to take part in the so-called triangular trade was very dramatic and cost many lives. During the following years the company confined its trade to the West Indies until a new company, The Guinean Company, took over their ships, forts and trading privileges in 1765. The transatlantic slave trade was the most extensive forced transportation of human beings in history. Millions of Africans were carried across the Atlantic Ocean to the Americas. The ships are gone, but their tracks remain on the ocean floor. This Internet exhibit is about the Danish-Norwegian slaver, "Fredensborg". The ship ran aground on the southern coast of Norway on December 1, 1768. Her journey in the triangular trade, between Denmark, West Africa and the Virgin Islands, was nearly completed. Remains of artefacts from the wreck, combined with the ship's papers - brought ashore after the grounding, and preserved - give us an outstanding documentation of the European triangular trade. 1733 The Danish West India Company buys St. Croix from France . A new town at Christiansted is planned. 1734 Moravian missionaries start settlements and missions on St. Croix . 1735 A survey divides island into nine quarters, which still exist today. Sugar and cotton plantations are laid out. 1738 Plans approved for the building of Fort Chistiansvaern. 1747 St. Croix is given its own government, separate from St. Thomas and St. John . The planters soon become frustrated with strict company regulations and petition the king to buy out the Danish West India Company. 1753 The Danish Crown takes over St. Croix . The economic prosperity of sugar cane, rum production, and the slave trade make St. Croix a leading port. The Danes designate the most profitable of the islands - St. Croix. It becomes the new capital for all three islands. Thus, the capital moves from Charlotte Amalie to Christiansted where it stayed until 1871. Fredensborg was a frigate built in Copenhagen in 1752 or 1753. She was named Cron Prindz Christian after the prince who was to become king Christian VII of Denmark and Norway, and was fitted out as a slave ship. After an unsuccessful stint in the triangular trade, her operational area was limited to the Caribbean, where she sailed as a trader until 1756. The ship was then purchased by another Danish company and renamed Fredensborg after one of the Danish-Norwegian trading stations on the African Gold Coast. On December 1, 1768 Fredensborg sank in a storm off Tromøy in Arendal, Norway. The wreck was discovered by divers in September 1974. One of them was Leif Svalesen who later has worked to document the ship. 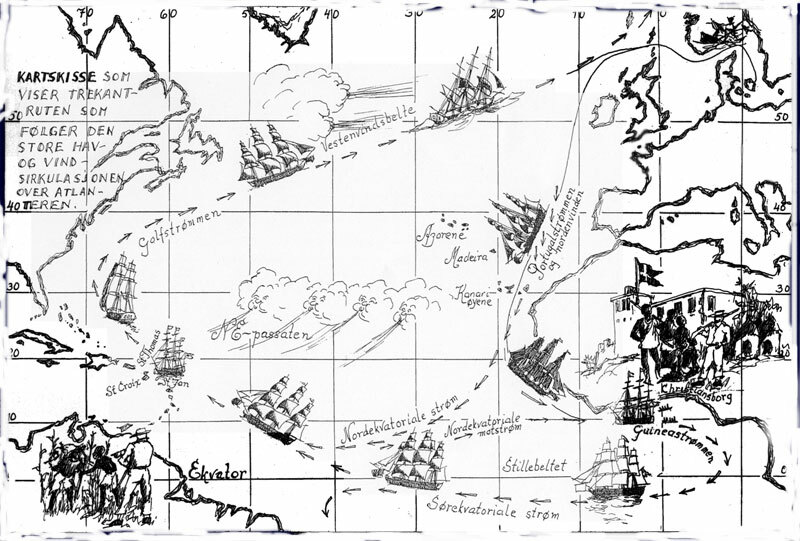 Fredensborg followed the well-established route of the slavers, providing for full cargoes on all three legs of the journey, and taking advantage of the prevailing winds and currents.